This Honda Lawn Mower, model HRR216PKA is a push type lawn mower, however it has many of the regular features that other Honda lawn mowers have. You can cut up to 21 inches wide traveling at your own speed as you push the lawn mower around your yard. There are 6 height adjustments and this is a three in one type of lawn mower. It includes discharge, mulching and bagging. There is no leaf cutter. 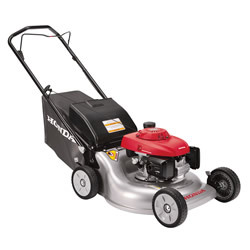 There are twin blades similar to most other lawn mowers made by Honda. They are supposed to do a superior job of cutting the grass into smaller pieces which makes it easier to bag as well as the grass will deteriorate faster when mulched. The warranty is 3 years for consumer use and 90 days for commercial use. 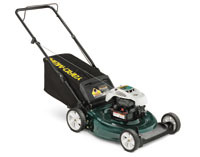 This is a great inexpensive lawn mower that has an automatic choke for easy starting. Easy starting Honda GCV160 Premium Residential Engine is certified to meet 50-state EPA and CARB emission levels. 3 in 1 capability: Mulch, bag, and discharge with no tools needed. This lawn mower although lower down in the line up for overall features is still a great lawn mower for those people who only have a small lawn to cut and do not mind pushing their lawn mower. The front wheels are plastic, while the rear wheels have ball bearings in them since they need to handle more weight. The grass catcher bag can hold up to 2.4 bushels in grass clippings which is sufficient for many lawns. If you plan to mulch your lawn, most people find with any mulching lawn mower that they work much better if you cut your grass more often before it gets too long. The lawn mowers can do a much better job when the grass is around an inch long in terms of new growth. The current price and specifications are subject to change and can be adjusted by the manufacturer at any time. Check with you local dealer for the latest pricing and specifications. For information about delivery methods for your lawn mower, accessories that you can purchase, safety rules to follow, proper operation and maintenance information, go to our page General Lawn Mower Information, to read more about these topics. 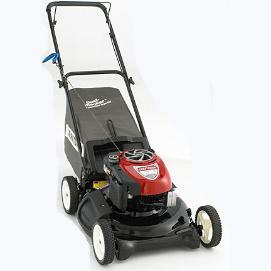 This Honda Lawn Mower model HRC216PDA, has an MSRP price of $749 at the time of writing. Check with your local dealer for up to date pricing and any changes to the specifications. Many dealers will offer sales prices and be willing to negotiate to increase their sales. 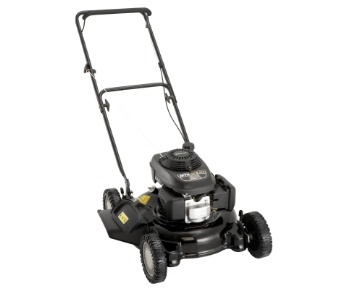 If you are not in a hurry to find a lawn mower, shop around can compare prices. It has a 21 inch wide cutting deck with a rear bag catcher or mulch configuration. It does not have a side discharge which some operators may look for. This is a push type lawn mower as well. This Honda Lawn Mower comes with a 160 CC engine and they claim it to be an easy starting engine. One big advantage of this lawn mower is the microcut twin blade technology. There are four blades that are cutting your lawn, which means that it cuts each blade of grass into a much smaller piece. Excellent for mulching as well as for bagging your grass clippings. It also comes with a front bumper and edge guards that will protect both the housing of the lawn mower but also your lawn ornaments and other items that may be on your lawn as you are cutting grass. it also comes with a 2 year residential warranty and a commercial warranty on the engine of 2 years and one year on all other components. Read more for specifications and features. Propulsion: This lawn mower is a push type lawn mower. This lawn mower comes with a height adjustment system of 8 positions from 3/4 inches all the way up to a 4 inch height for leaving your grass extra long. It is recoil start, in other words you need to start the engine by pulling on the starter chord. There is also a standard manual choke system which should be engaged when the engine is cold to enhance starting. For the detailed specifications, read the list above, however the most exciting part of this lawn mower is the twin blade microcut system which provides four cutting surfaces to chop your grass into finer particles making it much easier to disintegrate if you mulch and to bag if you plan to capture your grass and dispose of it by other means. Many people prefer to mulch their grass for a number of reasons including that the grass provides nutrients back into the lawn as it decomposes and you do not need to deal with bagging and disposing of the grass clippings. The environmental advantages of leaving your mulched grass clippings on the lawn are superior to leaving them at the curb to be disposed of. Finally this is a push type lawn mower. If you are looking for a self propelled model you will need to consider another model that has this feature. Self propelled models are very handy especially if you have slightly hilly terrain to navigate. The MTD Gold Push Mower 109Q is a great little lawn mower for urban consumers who need a small lawn mower, that is gas powered and can be stored easily. You probably do not want to cut a large lawn with this 20 inch lawn mower, however for small lawns it is ideal. With a low emission engine certified engine, a 20 inch dome mulching deck and 9 position wheel height adjustment for each wheel it will more than meet your needs. There is a side grass bag that can also be purchased as an accessory if you really need to catch the grass clippings, however after using a mulching lawn mower myself, I would never use a grass catcher again unless for some reason I let the grass get too long. Mulching lawn mowers are great especially when you cut the grass often and do not let it too long. Sometimes I will also use the grass catcher to collect leaves as long as there are not too many. This MTD Gold Push Mower 109Q also comes with folding handles for easy storage between lawn cutting or over the winter. It also comes with a bottle of oil so you just need to add the oil, put gasoline in the fuel tank, unfold the handles and you are ready to go. The wheels are all the same size, and have steel ball bearing wheels for longer life. This is a great little push lawn mower which will last many years for the average urban home owner assuming you follow the standard maintenance recommended for this lawn mower. Delivery: Most lawn mowers can be picked up in the store, however if you do not have the means to take it home yourself, delivery usually can be arranged for a delivery charge. You may want to consider borrowing a trailer or a van to bring home your lawn mower and avoid the delivery charge. The MTD Gold Push Mower 109Q can be purchased at many stores across Canada. All lawn mowers should be treated with respect. They are powerful machines and in the wrong hands can do a lot of damage. Start by reading the manual and following all of the safety guidelines outlined in the manual. Never work on the lawn mower without first ensuring that the engine is turned off. While cutting the lawn and using the side discharge, never allow anyone to stand beside the discharge or point the discharge at something that could be damaged by high speed flying objects ejected from the lawn mower. Always check the engine to make sure that there is sufficient oil in the engine before starting each day. Top up if necessary. Fill the fuel tank while the engine is cool. A good time to do this is before you start cutting the lawn. Fuel spills can sometimes cause fires. If you do spill any fuel, wait until it evaporates prior to starting the engine. Always fill the fuel tank outdoors. Shut the engine off before removing the rear bag to empty it of grass or making any other kind of adjustments to the lawn mower. Maintenance of the lawn mower is pretty straight forward. Read the guidelines in the manual and follow them. Arrange to have your engine tuned up once a year and the oil changed at the same time. This applies to most consumer applications where you are cutting your lawn once a week. If you are using the lawn mower for commercial applications you may need to change the oil more often. Keep the housing free of debris to avoid the acid from the grass causing the housing to deteriorate. Also keep grass from building up around the muffler to avoid the possibility of fire. Check the spark plug to ensure that it is not corroded and dirty. Replace if it is pitted. Always use clean fresh gasoline for your lawn mower. Following these tips and others in the manual will ensure that your lawn mower will last for many years. The MTD Gold High Wheel Push Mower model 549Q is sold by many dealers across Canada and the US, and is one of a line of product brands that MTD sells. These brands include Bolens, Cub Cadet, Troy-bilt, White, Yardman, MTD Pro and Yard Machines. The MTD Gold High Wheel Push Mower model 549Q has a Honda 160cc overhead cam, 4 cycle engine, no mixing of gas and oil, emission certified low noise engine. The MTD Gold High Wheel Push Mower model 549Q is a rear bag discharge grass collector style of lawn mower. Conversion to mulching can be completed almost instantly without tools. Rear bagging of grass cuttings is far superior to side bagging. The lawn mower has better balance and it is much easier to navigate around shrubs and trees. In addition the larger wheels at the back provide additional strength to support a heavy bag of grass cuttings. As a result they are also more maneuverable with a grass catcher around shrubs and other tight spaces. Each wheel can be individually adjusted to the desired height for perfect grass cutting. The MTD Gold High Wheel Push Mower model 549Q comes partially assembled with consumers completing assembly in a matter of minutes. Make sure you add the oil to the engine prior to starting for the first time. The MTD Gold High Wheel Push Mower model 549Q comes with a 3 year limited warranty. Of course, Consumers concerned about what is covered and what is not covered should review the limited warranty before purchase. The rear discharge kit was the only accessory mentioned. The MTD Gold High Wheel Push Mower model 549Q can be purchased at a number of dealers around the country. We did not see a price on the company’s website for this push lawn mower. Consumers who take good care of the MTD Gold High Wheel Push Mower model 549Q will have a lawn mower that lasts for many years. Subsequently after every grass cutting, clean off the deck of the lawn mower. This prevents buildup of wet grass that is acidic. It can over time eat away at the deck of the lawn mower. Build up of grass near the exhaust can also ignite a fire or at least cause a lot of smoke to be generated. If you do not think this can happen, the writer can attest that it actually happened on his lawn mower. Also, before starting the MTD Gold High Wheel Push Mower model 549Q each time, check it over to confirm there are no loose parts. Also that there is sufficient oil in the engine and sufficient gasoline in the tank for to cut your lawn. As a general rule you should not fill a gasoline tank while the engine is hot. Change the oil based on the recommendations of the manufacturer, however it should be changed at least once per season as a minimum and more often if you are a heavy user and have a lot of lawn to cut. A few comments about safety and operation of the MTD Gold High Wheel Push Mower model 549Q are needed. When ever you are working on the lawn mower always shut the engine off. Never try to clear grass from the housing while the engine is running. The same goes for oil changes and changing the grass catcher. But many people will circumvent what is known as the dead man’s switch i.e. when you release the bar, the engine stops. However some people will wire these closed so that the engine remains running even if your hands are not on the push handle. As a result we strongly recommend against this approach. Never allow the engine to run while you are doing anything other than cutting grass. Sometimes sharp objects could exit out of the opening at the back while the grass catcher bag is removed or out of the side discharge if you are using that option. Sharp objects can damage and hurt anything in their way. Just turn off the machine before doing any maintenance. The Bolens Push Mower Model 549Q comes with a Honda 1600cc OHC engine featuring low emissions, and a low noise engine with a rear bag grass catcher. Consumers can choose between mulching, discharge and using the rear bag grass catcher to deal with various lengths of grass and conditions. The rear bag grass catcher is better than a side discharge catcher since it takes much less room and is much easier to navigate around landscaping and other obstructions normally found in urban areas. The rear wheels are 12 inches high providing great strength and maneuverability to move around your lawn with a full bag of grass clippings. This is a great lawn mower and will suit the needs of most consumers with average size lawns. It is not a self-propelled lawn mower and if you have large lawn or sloped lawn a self-propelled lawn mower might be considered. The engine has an auto choke feature so there is no need for priming. Just pull out the choke and pull the cord to start the engine. Note if the engine is hot, you should not need to pull the choke out. Once the engine starts, push the choke in to ensure smooth engine operation. This lawn mower can be running within a few minutes of it arriving at your home. Just add oil and fuel, read the instructions and start the engine. You are ready to use this self propelled lawn mower . Storage is convenient with the folding handle and the air filter is easy to get to. With a slightly wider cut at 21 inches you can make short work of any urban lawn. Always check the engine to make sure that there is sufficient oil in the engine before starting each day. Top up if necessary. Fill the fuel tank while the engine is cool. A good time to do this is before you start cutting the lawn. Spilled fuel can sometimes cause fires. If you do spill any fuel, wait until it evaporates prior to starting the engine to avoid any chance of fire. Always fill the fuel tank outdoors. sThe Bolens Push Lawn Mower 109Q is a great utility lawn mower with all of the main features that you will need to cut your lawn. While it does not have the self-propelled feature that many people are looking for these days, it is easy to push and with a wide 20 inch deck, you can make short work of your lawn. This is a basic lawn mower, however it can be purchased with an optional grass catcher on the side to catch grass clippings if you prefer this approach. There is also a side discharge and a mulching feature if you prefer to mulch your grass. Note that if you allow your grass to get too long, the dealers recommend that you cut the grass and either use the side discharge or the grass catcher. Trying to mulch long grass just does not work well with todays lawn mower mulching lawn mowers. Propulsion: The Bolens Push Lawn Mower 109Q is a push mower. The Bolens Push Lawn Mower 109Q features individual wheel adjustments with 9 different positions. The wheel bearings are made of steel which will provide longer life for your lawn mower. It comes with a 4 year warranty and also a deluxe comfort bail to reduce hand fatigue if you have a large lawn to mow. The lawn mower can be assembled in a few minutes and it comes with the first bottle of oil for your lawn mower. These are great utility lawn mowers for the average home owner at a decent price. Delivery: Most lawn mowers can be picked up in the store, however if you do not have the means to take it home yourself, delivery usually can be arranged for a delivery charge. You may want to consider borrowing a trailer or a van to bring home your lawn mower and avoid the delivery charge. This lawn mower can be purchased at Lowes. All lawn mowers should be treated with respect. They are powerful machines and in the wrong hands can do a lot of damage. Start by reading the manual and following all of the safety guidelines outlined in the manual. Work on the lawn mower only after first ensuring that the engine is turned off. While cutting the lawn and using the side discharge, never allow anyone to stand beside the discharge. Do not point the discharge at something that could be damaged by high speed flying objects ejected from the lawn mower. Keep the housing free of debris to avoid the acid from the grass causing the housing to deteriorate. Also keep grass from building up around the muffler to avoid the possibility of fire. Check the spark plug. Make sure it is not corroded and dirty. Replace pitted spark plugs. Always use clean fresh gasoline for your lawn mower. Follow these tips and others in the manual and your lawn mower will last for many years. The Yardman 190CC 21 3-in-1 Push Mower comes with a 190 cc engine and a 21 inch cutting deck. There is also a 3 in 1 combination which means you can bag it, mulch it or discharge the grass clippings out the side of the lawn mower. Regardless of the type of lawn you have, you can switch between these modes easily and quickly to deal with long grass or aim for that golf course look. The rear bag for catching grass clippings will hold 1.9 bushels . Starting the engine is easy with the usual recoil starter. There are also dual cutting height controls which provide a 6 position height adjustment to allow you to cut your lawn at just the right height. Keep it longer during the dryer summer months and cut it short during the wet spring time of the year. 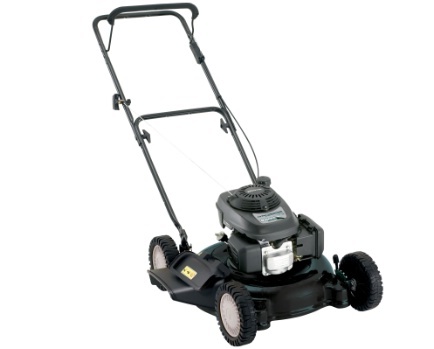 This is a great lawn mower for most urban lots that have a relatively small lawn to cut every week. Using a push lawn mower will also give you lots of exercise. Delivery: Most lawn mowers can be picked up in the store, however if you do not have the means to take it home yourself, delivery usually can be arranged for a delivery charge. You may want to consider borrowing a trailer or a van to bring home your lawn mower and avoid the delivery charge. 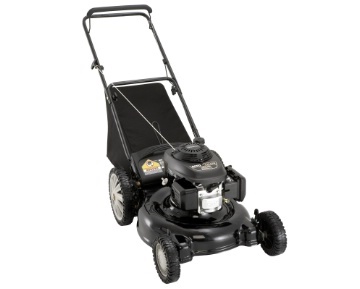 You can get the Yardman 190CC 21″ 3-in-1 Push Mower at Walmart! Always check the engine to make sure that there is sufficient oil in the engine before starting each day. Top up if necessary. Fill the fuel tank while the engine is cool. A good time to do this is before you start cutting the lawn. Spilt fuel can sometimes cause fires. If you do spill any fuel, wait until it evaporates prior to starting the engine to avoid any chance of fire. Always fill the fuel tank outdoors. The Yardman 158CC 21″ 2-in-1 Push Mower can be purchased at Walmart and picked up in the store. With rear wheels slightly larger and a 2 year limited warranty, and the Walmart name you cannot go wrong with this lawn mower. One thing about Walmart is that they stand behind all of their products and if it does not work to your satisfaction, usually you can return the item with no questions asked. 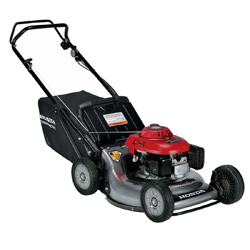 A Twenty one inch cutting deck and the famous Briggs & Stratton engine make this a great addition to your lawn maintenance. All lawn mowers should be treated with respect. They are powerful machines and in the wrong hands can do a lot of damage. Start by reading the manual and following all of the safety guidelines outlined in the manual. Never work on the lawn mower with out first ensuring that the engine is turned off. Keep the housing free of debris to avoid the acid from the grass causing the housing to deteriorate. Also keep grass from building up around the muffler to avoid the possibility of fire. Check the spark plug to ensure that it is not corroded and dirty. Replace pitted spark plugs. Always use clean fresh gasoline for your lawn mower. Following these tips and others in the manual will ensure that your lawn mower will last for many years. The CRAFTSMAN MD 21 Push 3 in 1 Gas Mower with High Rear Wheels is a push lawn mower with the advantage of having larger rear wheels which makes this lawn mower easier to maneuver, particularly when the rear bag is full of grass. The larger rear wheels provide more leverage for the operator and make it easier overall to push. 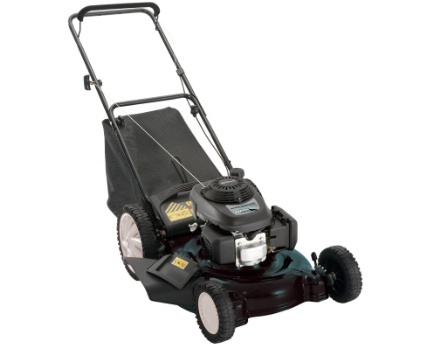 The 21 inch deck is a standard width and is suitable for most suburban lawns as is the 190cc Briggs and Stratton engine. Consumers can adjust the lawn cutting height to one of 5 positions allowing you to tailor your lawn for the look and feel that you desire. From the manicured golf course look to the longer grass during dryer periods, you can cut your lawn at one of 5 heights. A big advantage of this particular engine is the no choke and no priming start. Just pull the cord and you are ready to go. This lawn mower comes with the 3 in 1 system that allows the operator to chose between mulching the grass, bagging the grass clippings or spreading the clippings on the lawn through the side discharge. Add fuel stabilizer to the gas cap so that it will drip into the fuel tank and maintain your gas for as long as 6 months. This is particularly helpful if you live in northern climes and do not use your lawn mower over the winter. There were 6 review on this particular lawn mower at the time of preparing this review all positive and supportive of this model. This appears to be an excellent lawn mower as indicated by consumers who have purchased this lawn mower. Delivery: All lawn mowers can be picked up at the store or dealer you purchased the lawn mower from. For an additional fee, most will also deliver the lawn mower to you at your home. All motorized equipment should be treated with respect and care. Start by reading all of the safety and operating guidelines outlined in the manual that comes with the CRAFTSMAN MD 21” Push 3-in-1 Gas Mower with High Rear Wheels. Follow these guidelines carefully and you should not have any problems with operating the lawn mower. When using the side discharge, never allow anyone to stand in front of the discharge unit to avoid being hit by any debris. Shut the engine off before removing the rear bag to empty it of grass or making any other kind of adjustments to the lawn mower. Maintenance of the CRAFTSMAN MD 21 Push 3 in 1 Gas Mower with High Rear Wheels is pretty straight forward. Read the guidelines in the manual and follow them. Arrange to have your engine tuned up once a year and the oil changed at the same time. This applies to most consumer applications where you are cutting your lawn once a week. If you are using the lawn mower for commercial applications you may need to change the oil more often. 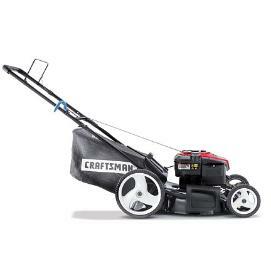 The CRAFTSMAN MD 21″ 3 in 1 Gas Mower is a push type lawn mower. There is not a self propelled option with this model. Consumers looking for self propelled models should look to other models and posts if they need a self propelled mode. As a result it is a little cheaper than other lawn mowers, since there are less features and less material in the lawn mower. Of course you will get more exercise with this lawn mower, which is not a bad thing in todays world. This is a 3 in 1 lawn mower meaning that you can use the rear bag grass catcher or you can mulch your lawns clippings or just spread them on the lawn through the side discharge. Either way you can achieve that manicured look to your lawn by adjusting the height to a desired level and cutting the lawn catching all grass clippings so that it has that perfect look. The wheels are all 8 inch diameter wheels. 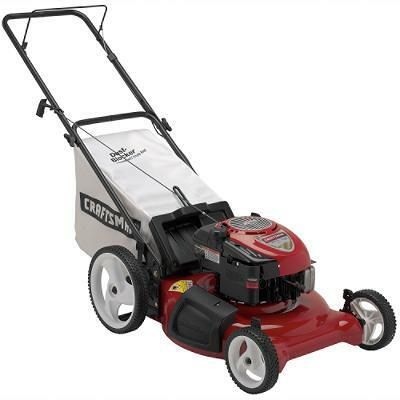 Craftsman has recently added a customer comments section with this lawn mower receiving one very positive review so far. CRAFTSMAN® exclusive MRS (Most Reliable Starting) with concentrated spark energy plug for easier starting under all starting conditions. Although this model lawn mower is 1 inch smaller than many other consumer lawn mowers, you will still be able to make short work of your lawn. It is a basic model with lots of features that make it a pleasure to use. It features a ready start system which means that you do not need to prime it or set the choke, just pull the starter chord and away you go. Another feature of this lawn mower and the Briggs and Stratton engine is the fresh start cap. Basically you add fuel stabilizer to the cap which will slow drip into the tank and keep the gas fresh for up to six months. This can be important for people living in northern communities who put there lawn mowers away for the winter months. All motorized equipment should be treated with respect and care. Start by reading all of the safety and operating guidelines outlined in the manual that comes with the CRAFTSMAN MD 21″ 3 in 1 Gas Mower. Follow these guidelines carefully and you should not have any problems with operating the lawn mower. When using the side discharge, never allow anyone to stand in front of the discharge unit. This is required to avoid being hit by any debris. Shut the engine off before removing the rear bag to empty it of grass or making any other kind of adjustments to the lawn mower. Maintenance of the CRAFTSMAN MD 21″ 3 in 1 Gas Mower is pretty straight forward. Read the guidelines in the manual and follow them. Arrange to have your engine tuned up once a year and the oil changed at the same time. This applies to most consumer applications where you are cutting your lawn once a week. If you are using the lawn mower for commercial applications you may need to change the oil more often. The Craftsman rear bag push lawn mower with a high rear wheel is another member of the famous high quality Craftsman family. This lawn mower is the push type with a rear bag to catch the grass and large rear wheels to support the extra weight and make maneuverability easier. Large rear wheels really make a difference with rear bag grass catchers. This Craftsman push rear bag lawn mower also has a side discharge allowing the lawn mower to be converted to a side discharge for grass clippings. It only takes a few minutes to make the change. The Craftsman push rear bag lawn mower can be picked up at your local Sears store or you can arrange for it to me delivered. Cost of shipping is extra. You can also order the Craftsman push rear bag lawn mower on line. At time of writing this Craftsman push rear bag lawn mower was on sale for $239.88 while quantities lasted. Delivery can be arranged and you can order the lawn mower online. There is even a calculator to help you figure out what the shipping charges will be for delivery. The web site will also provide anticipated shipping and delivery dates. The Craftsman push rear bag lawn mower comes assembled. All you need to do is check the oil level and add fuel. At the time of writing this Craftsman push rear bag lawn mower had 31 reviews with an average rating of 3.5 stars out of 5. You have to give credit to Sears. They stand behind their products and are not afraid to take criticism. Gives them real customer feedback and identifies problems which they can focus on and deal with. Not all lawn mower sales companies do this. Hats off to Sears. Several of the reviews that were negative talked about too much plastic, difficulty with the wheel height adjusters and one review had a starting problem which the company was having difficulty fixing. It was under warranty and there was no problem with getting repairs, the Craftsman push rear bag lawn mower was just not being fixed properly. Overall the reviews were very positive so it looks like the Craftsman push rear bag lawn mower is a great lawn mower to consider for cutting your lawn. Feel free to add you own comments to this post. The Craftsman push rear bag lawn mower has the standard rear start controls and lever that must be held down in order to keep the engine running. This lever is there for a reason. It prevents the operator from working on the engine or clearing grass or removing the rear bag while the engine is still running. Never try to circumvent this basic safety feature. Operation is a simple pull the lever towards you, pull the start chord to start. There is no electric start on this lawn mower. If you plan to use the side discharge always operate the Craftsman push rear bag lawn mower in a safe manner. Avoid aiming the discharge at other people, buildings or cars. Sharp objects may be expelled from time to time potentially causing harm to the object they hit. Prior to starting each day check the Craftsman push rear bag lawn mower for loose bolts, loose hardware and ensure that the rear bag is securely attached. Check the engine oil level to ensure there is sufficient oil in the engine in case there are leaks of some kind. Maintenance of the Craftsman push rear bag lawn mower is pretty straight forward. Always use fresh fuel and if the Craftsman push rear bag lawn mower will not be used for several months consult the manual to determine the best approach. Some recommend draining the fuel tank while others will suggest adding fuel additives to preserve the fuel. The oil should be changed on a regular basis on the Craftsman push rear bag lawn mower. Consult the manual for instructions regarding how often and how to go about changing the oil. At minimum change the oil in the Craftsman push rear bag lawn mower at least annually. Maintenance on the Craftsman push rear bag lawn mower is pretty simple. However not everyone is comfortable in performing even basic maintenance like oil changes. Consumers should take their lawn mower into a Sears / Craftsmen recognized maintenance facility to have their lawn mower maintained while under warranty. You may also want to get to know your local small engine mechanic. He may obtain better prices and advice. I look after my own Craftsmen lawn mower. However I have benefited from talking to a local small engine repair shop several times when I needed help with what I thought was a tricky repair. I have always purchased the parts I needed from him, even if they were a bit more expensive. The assistance I received more than offset the extra few dollars it cost me to purchase parts from his shop. The MTD Gold High Wheel Push Mower model 589Q is sold by many dealers across Canada and the US. And it is one of a line of product brands that MTD sells. These brands include Bolens, Cub Cadet, Troy-bilt, White, Yardman, MTD Pro and Yard Machines. The MTD Gold High Wheel Push Mower model 589Q has a Honda 160cc overhead cam, 4 cycle engine, emission certified low noise engine. The MTD Gold High Wheel Push Mower model 589Q is a rear bag discharge grass collector style vs. the bag on the side. However conversion to mulching can be completed almost instantly without tools. When you use rear bagging it is far superior to side bagging. The lawn mower has better balance. It is much easier to navigate around shrubs and trees. In addition the larger wheels at the back provide additional strength to support a heavy bag of grass cuttings. Also they are also more maneuverable with a grass catcher around shrubs and other tight spaces. In addition each wheel can be individually adjusted to the desired height for perfect grass cutting. The MTD Gold High Wheel Push Mower model 589Q comes partially assembled . Consumers must complete assembly in a matter of minutes. Make sure you add the oil to the engine prior to starting for the first time. The MTD Gold High Wheel Push Mower model 589Q comes with a 3 year limited warranty. Always review what is covered and what is not covered should review the limited warranty before purchase. The MTD Gold High Wheel Push Mower model 589Q can be purchased at a number of dealers around the country. We did not see a price on the company’s web site for this push lawn mower. Consumers who take good care of the MTD Gold High Wheel Push Mower model 589Q will have a lawn mower that lasts for many years. After every grass cutting, clean off the deck of the lawn mower to prevent buildup of wet grass. Over time eat away at the deck of the lawn mower. Build up of grass near the exhaust can also ignite a fire or at least cause a lot of smoke to be generated. If you do not think this can happen, the writer can attest that it actually happened on his lawn mower. Also, before starting the MTD Gold High Wheel Push Mower model 589Q each time, check it over to confirm there are no loose parts, that there is sufficient oil in the engine and sufficient gasoline in the tank for to cut your lawn. As a general rule you should not fill a gasoline tank while the engine is hot. Change the oil based on the recommendations of the manufacturer. However it should be changed at least once per season as a minimum and more often if you are a heavy user and have a lot of lawn to cut. For more push type lawn mowers, click here. A few comments about safety and operation of the MTD Gold High Wheel Push Mower model 589Q and really any lawn mower. When ever you are working on the lawn mower always shut the engine off. Never try to clear grass from the housing while the engine is running. The same goes for oil changes and changing the grass catcher. Many people will circumvent what is know as the dead man’s switch i.e. when you release the bar, the engine stops, however some people will wire these closed so that the engine remains running even if your hands are not on the push handle. We strongly recommend against this approach. Never allow the engine to run while you are doing anything other than cutting grass. Sometimes sharp objects could exit out of the opening at the back while the grass catcher bag is removed. Sharp objects can damage and hurt anything in their way so just turn off the machine before doing any maintenance.